3.4.01; Unfassbar: Alt-Nazi verklagt Artur Brauner, Berliner Kurier, 4.5.01; Priebke verklagt Journalist, taz/dpa 10.3.00. On July 22, 1997, former Nazi SS Captain Erich Priebke was convicted by an Italian military tribunal for his role in the 1994 massacre of 355 Italian civilians in the Ardeatine caves outside of Rome. He was sentenced to fifteen years in prison, but the court reduced his sentence by ten years to account for an amnesty enacted years ago. The massacre was carried out as a reprisal for the killing of thirty two German soldiers by the Italian resistance movement. Adolf Hitler himself ordered the Gestapo to punish such uprisings by killing ten civilians for every dead officer. Priebke, who openly discussed his involvement in the massacre to Sam Donaldson of the ABC News show "Primetime" in 1994, justified his action with the excuse that he was following the orders of Gestapo Chief Herbert Kappler. Priebke told Donaldson that the victims, including boys of fourteen and men as old as seventy-five, were nothing but "terrorists." He admitted drawing up the lists of those who would be executed, including some seventy Jews, and has even admitted to killing one of them himself. In addition to the massacre, Priebke is thought to be responsible for the deportation of six to seven thousand Jews from Italy to the Auschwitz concentration camp, as well as the torture of political prisoners. Following the Donaldson report on Priebke, which demonstrated both how openly he was living in Argentina and how little remorse he held for his actions, the eighty-two year old was arrested to await extradition to Italy on charges of homicide and crimes against humanity. Because of his age and poor health, Priebke was not incarcerated but placed under house arrest in his home in Bariloche, a ski resort 1,100 miles southwest of Buenos Aires, where he lived freely since 1949. The extradition proceedings faced continual delays, as Priebke's attorneys used such tactics as requiring that all Italian documents be translated to Spanish--a process that could have lasted two years. The Argentine courts eventually rejected this particular delay, but appeals and other motions dragged the proceeding out for nearly a year as the defense attorneys argued that there was no legal grounds for extradition since the fifteen year statute of limitations on homicide had expired. In March of 1995, after nine months of legal delay, Argentine President Carlos Menem and Argentine Supreme Court Chief Justice Ricardo Levene promised to B'nai B'rith President Tommy Baer that case would be resolved and Priebke sent to Italy by the end of the month. In spite of these promises, the Supreme Court ruled that the case be returned to the District Court in Bariloche where the case was originally brought. This opened the door to years of delay from future appeals, with the elderly Priebke resting comfortably at home under house arrest. In May of 1995, Argentine Federal Judge Leonides Moldes approved the extradition request on the grounds that crimes against humanity are not subject to the statute of limitations. But the appeals continued, and there were rumors for months that the courts would overturn the decision. In August of 1995 an appeals court overturned the extradition order, citing the statute of limitations. In an effort to keep the pressure on the Argentine government, Germany filed an extradition request the following day. Italian military prosecutor Antonio Intelisano argued that UN agreements, to which Argentina is a party, place war crimes and crimes against humanity outside of statutes of limitations. He lamented that some countries, including Argentina and France, have interpreted UN guidelines to say that war crimes have a limit of twenty years, but he noted that crimes against humanity are universally regarded as outside the statute of limitations. Priebke was charged with both war crimes and crimes against humanity. Finally, in November of 1995, the Argentine Supreme Court ordered Erich Priebke to be extradited after seventeen months of delay. Italian authorities quickly escorted him to Italy to stand trial for his crimes. The prosecutor was not, however, able to prove the aggravating circumstances necessary to override Italy's thirty year statute of limitations on murder. It was later determined by Italy's highest appeals court that the original court was biased, and he was retried in a military court. Finally, after fifty-three years, he was convicted. 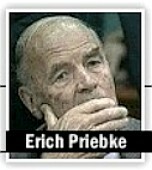 Though the prosecution sought a life sentence, Erich Priebke was sentenced to only fifteen years. The court then reduced the sentence by ten years because of an amnesty enacted years ago that covered a variety of war crimes. His sentence is effectively five years, and it is unclear whether the year-and-a-half he spent in Italy awaiting trial and verdict will count toward time served. At the same time, eighty-four-year-old former SS Major Karl Hass was convicted for involvement in the same crime. His ten year and eight month sentence was suspended and he was allowed to go free. Though many thought the sentences were too light, the fact that these men were successfully brought to trial some fifty years after the fact cannot be overlooked. Argentine Foreign Ministry records indicate that the country was a safe haven for many Nazis following the Second World War, many of them living openly and under their real names. Priebke, who claims he has never hidden at all from the law, had been registered with the German embassy since 1952. He originally came to the country with false identification papers, but reclaimed his true identity shortly thereafter and made no efforts to hide his past from the authorities. Since 1950, more than a dozen requests for extradition of Nazis from Argentina have been filed, though only three were granted before Priebke. But the government of Argentina has recently promised to be more forthcoming and open. They have formed a research commission to examine Nazi involvement in post-war Argentina in the wake of the Swiss gold scandals. Various government officials, including Foreign Minister Guido Di Tella, have expressed interest in coming to terms with Argentina's past and allowing the history to be told. B'nai B'rith International and B'nai B'rith Argentina are both represented on the investigative committee in Argentina, and Foreign Minister Di Tella has promised B'nai B'rith he would oversee the production of a final report. In addition, there are several other nations which have opened their archives or established investigative commissions of varying forms. Whether the Priebke conviction and the various investigative commissions represent a new era of openness is not clear, but the message they send is: eventually the truth will always come out and justice will be served. ©1997 B'nai B'rith Center for Public Policy. All rights reserved. En 1995, Erich Priebke criminel de guerre SS était extradé d'Argentine, légendaire terre d'accueil de nazis à la fin de la Seconde Guerre mondiale. Un épisode surprenant devait marquer cette extradition: de nombreux amis ou anonymes avaient manifesté publiquement leur soutien à celui qu'ils considéraient comme un "bon voisin", un "notable exemplaire". Son arrestation mettait un terme à 50 ans de vie tranquille à Bariloche, ville touristique de Patagonie où il avait fait son nid en toute impunité, comme beaucoup d'autres. Comment l'ancien SS s'est-il intégré à cette communauté ? Comment certains habitants ont-ils pu prendre sa défense ? : le ton du film est donné. Des témoignages retracent l'incroyable ascension sociale de Priebke et nous entraînent dans cette ville nichée dans les marges de l'Histoire contemporaine. Ce film propose une réflexion rarement abordée: l'assimilation et ses conséquences des criminels nazis restés impunis. In 1995, former SS officer Erich Priebke was extradited from Argentina, that legendary asylum for Nazi war criminals at the end of World War II. The extradition was greeted by a surprising reaction: a number of people, friends or not, publicly demonstrated their support to this "good neighbor" and "model personality". His arrest ended 50 years of a quiet life in Bariloche, a tourist town in Patagonia where, like many others, he settled with complete impunity. How did this former SS man become part of this community? How could some of its inhabitants come to his defense? Witnesses describe Priebke's incredible social success and conduct us through this city nestled on the fringe of contemporary history. The film is a inquiry into a rarely-considered problem : the assimilation of untried Nazi war criminels and its consequences.